Back in the day, when I first started getting my portfolio together ( 👵🏻 )- I did what a lot of student designers do, and slapped up a simple image of the final product. I had a simple grid style portfolio and you could click around and look at the different projects. It was about as basic as you could get, it's no surprise I wasn't gaining any traction. Eventually, I discovered mockups, which helped improve the visual side of my project presentation. It helped give my work “life” and potential clients could better visualize what I was capable of. I would get a client job here and there, but nothing I could make a full time living off of. It wasn’t until I started creating flushed out case studies that my portfolio helped take me to the next level. 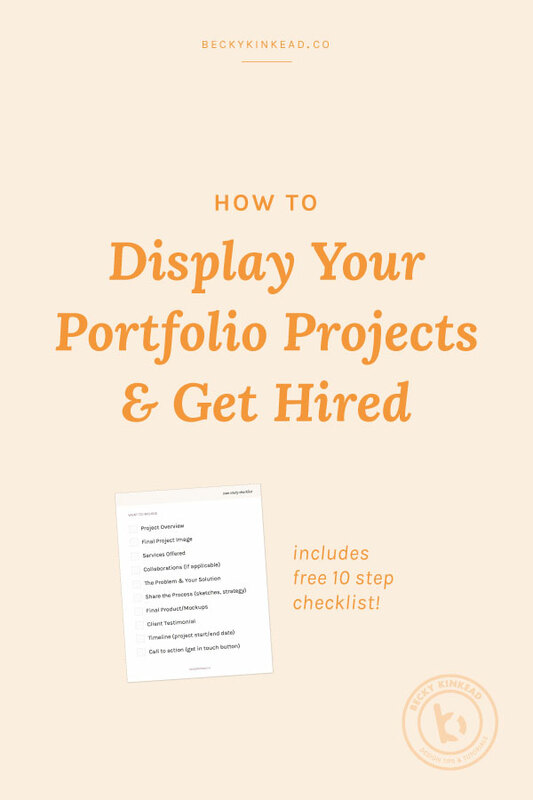 Today, I’ve outlined how a detailed and comprehensive portfolio can help you land more, quality projects. There’s also a handy checklist for you to print out, for each time you add a new project to your portfolio! So, why put together a comprehensive case study? The primary reason is to establish trust with your potential clients. As a designer, your job is to show that by hiring you, you can deliver results. The fact of the matter is, visual design really can help a business in a multitude of ways. With your case studies, you’re showing that you have a step by step process that will give your clients results if they hire you. Try to think of it from your potential client’s point of view. If all you have on your site is a grid of various pictures, they’re left with a lot of questions and make assumptions on your work. But when you lay out exactly what you do for your clients, you’re establishing yourself as a valuable professional, which helps you before, during and after the project is completed. There’s always barriers to entry when it comes to getting hired. Think of each piece of your case study as an extra step in breaking down those barriers. Download your free case study checklist! The Apartment shares well-rounded, comprehensive case studies-highly recommend checking them out! Here’s the thing, MOST designers aren’t doing detailed case studies. A lot of folks send me their portfolios and ask for reviews wondering what’s wrong with it, why isn't it working. Most of the ones I see have a couple of mockups and at best- a little background on who the client is. By adding just a couple of extra details, you will stand out from your competition and show that you take what you do for your clients seriously and really want them to see results from working with you. Simon Pan is proof that having just a few high quality case studies is better then a bunch of mediocre stuff. If you want to start a successful freelance business, or take your current one to the next level - it’s time to position yourself as an expert. And a solid portfolio with detailed case studies is the best place to start. By giving potential clients a step by step process of your work, you’re proving your value and expertise as a designer which will not only attract your ideal clients, but helps you in raising your prices too! Client name and a little bit about their business (2-3 sentences). Be sure to show a clear image of the final product right from the start. Make it clear what your role in the project was, logo design, web design, etc. Make sure to list anyone you worked with on this, creative director, illustrators. Not only do you want to give them credit (duh), but it shows that you’re good at working with others! What was the primary goal of the project? Describe your strategy, and steps you took to get to the final product. You can keep these simple, don't overthink it! A couple of sentences that show how you effectively solved the problem can do the trick. Share pieces of your strategy, it can help to pull primary themes from the creative brief. Take photos of your sketches, feel free to add captions describing the various directions you went in. Provide a couple high quality images of your work to prove you have the skills. Probably the one of the most important parts of your portfolio piece! It doesn’t have to be elaborate, but sharing a positive review from your client will do wonders in landing your next project. Consider adding project start/end dates. This is especially helpful for clients who are looking to book a project in the next few months. Don’t forget to give your potential client a clear next step. Now that they’ve reviewed your work what happens next? Add a call to action button “Like what you see? Click here to get in touch about working together” “Check out my services” “Inquire about services” etc. As you can see, there doesn’t necessarily need to be a 2000 word write up in your case study. You can be effective with a few sentences in each section, that get straight to the point. We Are Branch shows knock-out product shots paired with strong project overviews. How many case studies should you include? Alyssa Yuhas does a fantastic job sharing tangible results on projects. What if you don’t have any projects? Approach a non profit you admire within your community. Create a faux businesses (note that it was self-initiated). Redesign an existing project (note that it was self-initiated) & explain why yours is better. Don’t make this such a daunting task that it never gets done (I’ve been guilty of this in the past!) It helps if you keep yourself organized throughout your project, take notes and pictures of your sketchbook. Perhaps try drafting up a portfolio post right away and edit it throughout.